The following 101, on making sundried tomatoes in the oven, comes from Farm Aid’s ace volunteer coordinator and frequent HOMEGROWN contributor, Toni Tiemann. (Don't miss her list of items you might not be composting but could.) Thanks, Toni, and keep the good ideas cooking! I was on a sundried tomato kick recently until I realized I was spending about $5 for each small jar. Yikes. But without a food dehydrator, I thought I was out of luck when it came to making my own. Boy, was I wrong. Your yield will vary depending on what type of tomato you use, but considering how affordable tomatoes are at the farmers market, or if you grow them yourself, the result is a steal. These taste great in plenty of recipes (check out some examples below) but are also yummy as a stand-alone snack. 2. Roughly cut the tomatoes into bite-sized chunks. For a plum tomato, this means fourths. 3. Scoop out the seeds and extra juice. 4. Arrange the tomatoes in a single layer on the baking sheets. 5. Drizzle them with olive oil and toss to coat. 6. Although it’s not necessary, I seasoned my tomatoes before throwing them in the oven, and the result was scrumptious. I used the dry spices listed above and just sprinkled them on top of the tomatoes, but I’m sure fresh herbs would be equally, if not more, delicious. 7. Put the baking sheets in the oven and bake for 2 to 3 hours or until the tomatoes shrink to about a third of their original size. Baking time depends on the amount of moisture in the tomatoes, so it will vary by batch. 8. Remove the tomatoes from the oven and let cool. 9. Once cooled, your tomatoes are ready to use right away, or you can store them in an airtight container in the fridge. Your tomatoes will safely last this way for a few weeks. You can also store the tomatoes at room temperature in a jar or another airtight container, soaking in olive oil. (Add fresh basil, rosemary, and garlic cloves for extra flavor.) If you opt to leave the sundried tomatoes sitting out in oil, you’ll need to use them within a couple of days unless you can them. 2. Cover your pizza pan with cornmeal or flour. 4. Brush the oil from the sundried tomatoes onto the top of the crust. 5. Place the basil and peppers around the perimeter of the crust. Fold over to seal in the toppings for a stuffed crust. 6. Place the eggplant slices on the pizza. 7. Add sauce. If you’re using cheese, throw it on there. 8. Arrange the sundried tomatoes, basil, garlic, and onion on the pizza. 9. Bake for 15 to 20 minutes or until the crust is lightly browned and slightly crispy. 10. Let cool for 5 to 10 minutes. Enjoy! One note: I completely wing it when making this recipe, so these amounts are approximated. Feel free to mess around and tweak things to your own taste! 1. In a medium frying pan, sauté the onions and garlic using oil from the sundried tomatoes until soft but not fully cooked. 2. Add the Brussels sprouts and honey, stirring frequently until almost cooked. 3. Shred the sundried tomatoes and add them to the sprouts, along with the pine nuts. 4. Cook until the sprouts are golden brown. Then dig in. Still have more tomatoes? These treats taste great in just about anything: sandwiches, salads, pesto, pasta, hummus—you name it! Use your imagination and share your delectable results by posting a comment below! Got a question for Toni or your own tomato tip to share? Post it below and keep the conversation rolling! You might also be interested in the Dehydrating 101; the Solar Cooking/Solar Baking 101; the Drying Chili Peppers 101; the Fermented Chili Paste 101; the Small-Batch Canning 101; the Homemade Ketchup 101; and the Freezing, Drying, and Storing Herbs 101. You can always find more things to cook, preserve, make, craft, plant, grow, and season in the HOMEGROWN 101 Library. Hello!Please also try my recipe, i took it from http://bravocooking.com/oven-dried-tomatoes/. You may visit the site or reat right here. 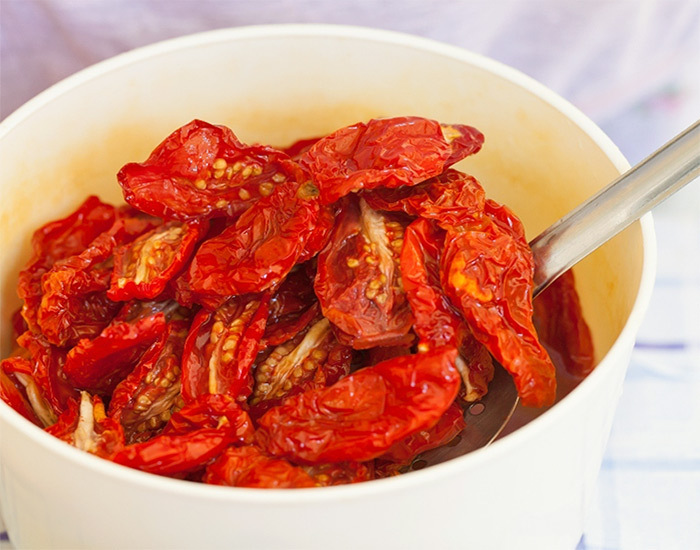 These oven dried tomatoes are delicious drained as an appetizer on toasted white bread or with cream cheese or ricotta cheese. Rinse tomatoes, cut into quarters, and remove seeds. Line 2 baking sheets lined with aluminum foil. Distribute tomatoes on baking sheets and season with salt, pepper, garlic, sugar and oregano. Dry tomatoes in the oven at 225°F (107° Celsius) for 2-2.5 hours, leaving the oven door cracked open. After 2 hours turn the oven off and leave for 1 hour. Then remove and let cool. Layer in sterilized jelly jars, cover with oil, and seal.